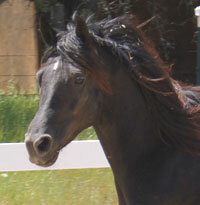 Mares of Faith Ranch Morgan Horses - Old Style Foundation Morgans suitable for the entire family! My black beauties! 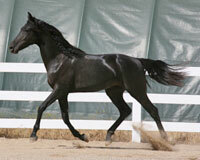 All three mares haves fantastic old bloodlines, great dispositions and are wonderful family horses. In addition to their correct conformation, they all have great feet, legs and good hard hoofs. 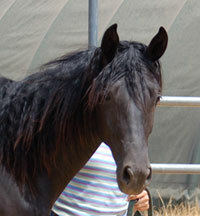 Kerry has that Morgan beauty with lots of thick wavy mane and tail; great conformation and a willing attitude. She has been used for driving, trail riding, Pony Club, x-country and has given us a beautiful, black filly who is 15.1 and growing. She is considered Foundation because of her older lines. (Flyhawk, Lippitt, Funquest, Caduceus breeding). 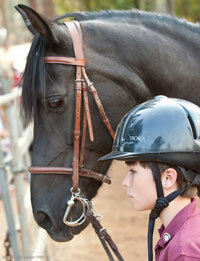 Black Velvet's Cassandra, "Cassie", is my son's horse. She loves kids and is very solid and dependable. She is a confident and very handy trail horse. She has a beautiful Morgan neck & face ewith large, kind eyes. She carries some older, well known, bloodlines on her papers such as Tutor, Antman (Mountcrest Sellman), and Orcland Dondarling. She is a farm favorite. Cassie and Spencer have really become best friends. 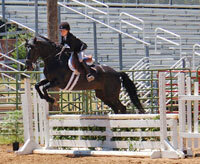 They ahve started their show career as well as trail riding here on the ranch. Spencer is older now & rides with style and confidence. Tall black, 2007 mare, 15.1+. Lyric is big boned, yet refined with a big eye, nice wide forehead, slightly dished face and tons of curly mane. She is a bold and curious girl with a future full of promise. 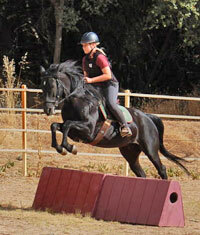 2004, 15.1h black Morgan mare. on the trail and nice gaits under saddle. Copyright Property of © Patricia Prouty, Faith Ranch Morgans All Rights Reserved.| Website by © deCastro Studios.